Good news? 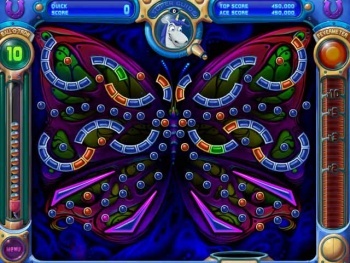 The release of Peggle Nights for the Xbox Live Arcade is only days away. Even better news? The wildly addictive game will cost you less than a meal at McDonalds. Specifically, creator PopCap Games is releasing the Xbox Live Arcade version of their followup to mega-hit Peggle on November 18. Those of you keeping score at home will realize that this is only two days away. Instead of releasing Peggle Nights as a standalone game (as it did with the title's PC release) Nights is going to launch as a downloadable add-on for the XBLA version of Peggle. Thankfully, this means PopCap is free to affix a miniscule price point to the game. Case in point: Nights will only set you back 400 Microsoft Points (read: $5). No version of Peggle has ever been more than $20 in any of its incarnations, so a low price point was to be expected, but offering such an addictive, widely-beloved game for $5 is sure to leave more than a few Business 101 professors choking on whatever those sorts of people eat for breakfast.